Easter was always an exciting holiday when I was growing up. I would spend the night with my grandparents the night before Easter, and I could SWEAR I heard the Easter bunny scooting across the floor in the night. Upon waking I’d bolt out of bed to see what candy and other treats I’d been brought, then we’d head to church for Easter services and a massive egg hunt. My day would end in a sugar coma on the couch, watching “The Wizard of Oz” with my parents. 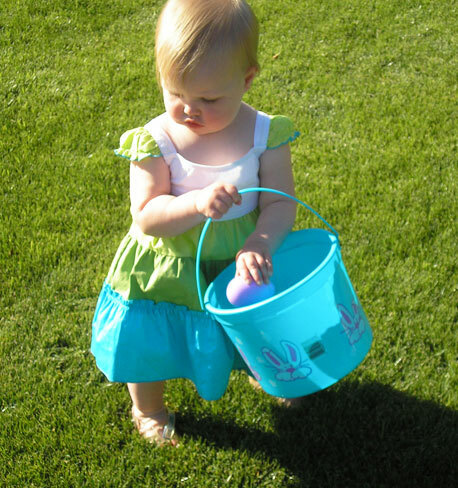 Below are 8 ideas for Easter traditions you can try with your own kids. Pick and choose a few of them each year … and stick with the ones your family loves! 1. There are so many great treats your family can make together a night or two before Easter. Dying and decorating hardboiled eggs is a classic, but you could also make something out of the ordinary like Jell-o eggs or egg-shaped sugar cookies. Last year my husband and kids made Rice Krispy eggs dipped in melted chocolate chips, then they added sprinkles before the chocolate set. 2. Kids enjoy sharing with others … and being sneaky! When dark hits the night before Easter, sneak over to a favorite neighbor’s (or drive to a close-by friend’s) and scatter eggs in their front yard. You can mix and match hard-boiled and plastic eggs. Fill plastic eggs with candy, coins, tattoos, stickers, erasers, etc. Even though doing an anonymous fun thing is great, these days you should probably leave a note or card on their door so they know it was you and not some crazy person putting stuff in their yard! 3. Bunnies and chicks are the unofficial mascots of Easter, so find a place where your child can pet some! Depending on where you live, bunnies and chicks can be found at kid-friendly farms, pet stores and zoos. Some stores have promotional days where you can come in and pet and hold these little sweeties and take pictures. And if you’re looking for a family pet, bunnies are a great option for an Easter gift to the family. 4. Get your child’s picture taken with the Easter bunny. This is one I could kick myself for not doing yet, but it’s pretty simple. Just check the website of your local mall to find out if they’re hosting an Easter bunny event. Be ready to shell out a few bucks for a photo, or take plenty of your own. 5. Easter baskets for the kids are a given, but they don’t have to be over-the-top. You can buy a simple empty basket at a craft store and fill it with things like pastel Peeps, toys, small books, plastic eggs filled with candy, etc. If you’re pressed for time and don’t know how you’ll be able to assemble an Easter basket, no matter how small, just buy one ready-made! You’re still an amazing parent, and your kid won’t care or remember that it was store-bought. If you have time but are short on money, bake treats to put in the baskets, make a special card for your child or write out coupons for things like getting out of chores or an ice cream cone out with just Mom. Don’t forget about your older kids on Easter … everyone can appreciate an Easter basket! 6. An Easter egg hunt can be held just about anywhere. Some churches have them days before Easter, and you don’t have to belong to that church. My church doesn’t hold an Easter egg hunt, so we have one in my mom’s yard after church on Easter Sunday. Family all pitches in and hides plastic eggs filled with candy, sugarless gum, dollar bills and more. You could also hide eggs the night before in your own yard (or even around the house!) after your kids go to sleep so they can have an after-breakfast hunt at their own home! 7. Get together with family for a special meal. If you won’t be able to be with family this Easter, invite some friends and neighbors over for a potluck meal at your place. It doesn’t have to be anything extravagant … a ready-made ham, paper plates and plastic cutlery just mean less time in the kitchen and more time with loved ones. 8. End the day relaxing with a bowl of Easter candy, some popcorn and a movie the whole family can enjoy. After a fun day celebrating Easter in all the ways you love, end your family day with some “hanging out” time. Nobody is allowed to text or play handheld video games or email. This is a time to snuggle up around the TV and reflect on the gift of family and friends. Kerrie McLoughlin is the proud and kooky mom of five. Check out their adventures at TheKerrieShow.com.